Push-to-talk is a service option available on G7c devices that allows them to function just like a two-way radio. Push-to-talk (PTT) eliminates the need to purchase, wear or manage separate radio and safety monitoring devices. This ground-breaking new addition to our G7 portfolio makes G7c the world’s first combined gas detector, radio and connected safety device. PTT delivers access to real-time communications, with options to immediately call teammates on the same channel or to switch channels to easily communicate with other teams. Unlike conventional radios, PTT has no radio licencing and no range limit. Leveraging integrated cellular communications, PTT doesn’t require additional wi-fi or costly radio infrastructure. PTT features an all-call broadcast channel, where managers or supervisors can quickly relay emergency broadcasts to every device on the network. Combining radio functionality with real-time safety features, PTT provides a connected solution enabling efficient communications throughout both day-to-day tasks and in the event of an emergency. Conventional radios typically only offer 16 or 32 channels, but PTT features 100 customizable channels that automatically connect to wireless cellular networks in over 100 countries. These channels can be easily tailored to an organizations structure, projects and sites, regardless of their location. With the ability to support up to 250 users on a single channel, users can easily collaborate to help adhere to project schedules and deadlines. With PTT, G7c’s functionality is expanded in a way that significantly improves employee efficiency and productivity. 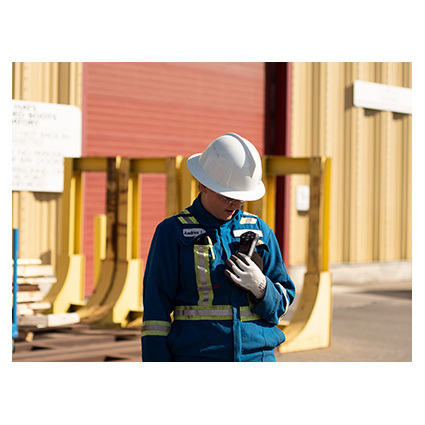 PTT integrates seamlessly with your device’s existing gas detection and real-time safety features, and G7c’s built-in cellular communications means it works right out of the box. Many businesses haven’t equipped each employee with two-way radios, but they wear a gas detector or lone worker monitor. Blackline addresses this by providing an affordable solution for businesses to combine three devices into one, allowing more employees to have access to radio functionality. Teams are able to stay in touch without having to stop work to access a phone or radio, increasing an organization’s overall productivity and keeping employees safe. With millions invested in technology research and development, Blackline Safety is recognized for quality and innovation. Our talented team of designers and engineers create and manufacture everything in-house — from wearable technology and personal gas detectors to cloud-hosted infrastructure and web-based interfaces for global industry. We deliver the world’s first turn-key, work-anywhere connected safety monitoring solution with gas detection, 3G wireless, two-way speakerphone and live monitoring to meet the demanding safety challenges of organizations in over 200 countries.